What size is a twin-size quilt? 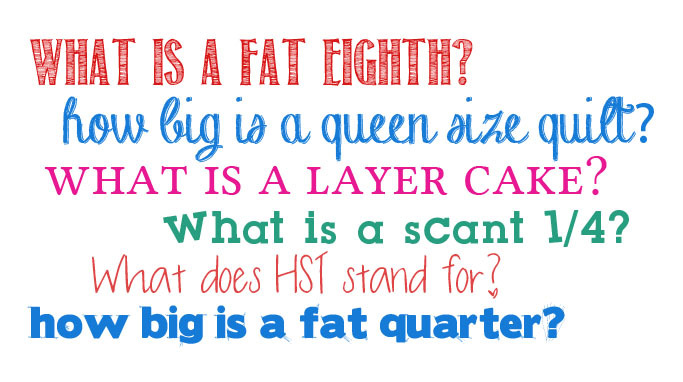 What is a fat eighth? What is a layer cake? What does WOF stand for? If these are questions you’ve had to ask or google, don’t be embarrassed because I have had to as well. Quilting is full of jargon that can be confusing if you’re new to quilting and to ask someone what it is would reveal just how little you know, right? I have had so many times of looking things up when planning a new quilt or something but I recently discovered this free downloadable eguide from Craftsy. It’s a life saver! Here’s a little look at it but you can download the full version here. It is a quick reference to so many of quilters’ questions, even if you have been quilting for a long time. You might not have the size of a king size mattress memorized. But it’s all on the free guide! Craftsy has such a wealth of information you wouldn’t even know. There’s so much more than just classes. If you are not sure about buying a class, try a free mini-class and see how you like the format. 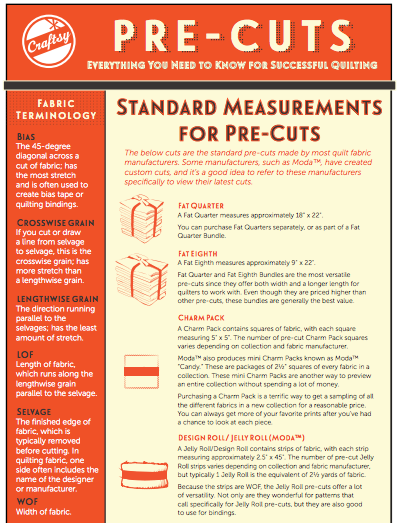 Download the free e-guides and quilt patterns. Craftsy is more than just taking a few classes, it’s a whole community of creative people trying to learn new skills and you can lean on them as well as the knowledgable instructors. I’ve learned a lot with my experience on Craftsy so far! I’m so happy to be blogging in behalf of Craftsy; all opinions are my own.